Parts of India are on track for severe water shortages, according to results from Nasa's gravity satellites. The Grace mission discovered that in the country's north-west - including Delhi - the water table is falling by about 4cm (1.6 inches) per year. Writing in the journal Nature, they say rainfall has not changed, and water use is too high, mainly for farming. The finding is published two days after an Indian government report warning of a potential water crisis. That report noted that access to water was one of the main factors governing the pace of development in the world's second most populous nation. About a quarter of India is experiencing drought conditions, as the monsoon rains have been weaker and later than usual. But weather and climatic factors are not responsible for water depletion in the northwestern states of Rajasthan, Haryana and Punjab, according to the Nasa study. "We looked at the rainfall record and during this decade, it's relatively steady - there have been some up and down years but generally there's no drought situation, there's no major trend in rainfall," said Matt Rodell, a hydrologist at Nasa's Goddard Space Flight Center near Washington DC. "So naturally we would expect the groundwater level to stay where it is unless there is an excessive stress due to people pumping too much water, which is what we believe is happening." 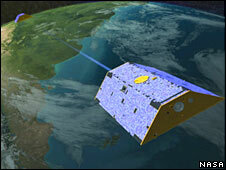 The Grace (Gravity Recovery And Climate Experiment) mission uses two satellites flying along the same orbit, one just in front of the other. Minute differences in the Earth's gravitational pull cause the two craft to shift slightly in their positions relative to one another. The mission can measure groundwater depletion because the amount of water in aquifers has a small gravitational attraction for the satellites. Three years ago, Grace scientists noted a loss of water in parts of Africa - but the Indian result is more striking. "Over the six-year timeframe of this study, about 109 cubic kilometres of water were depleted from this region - more than double the capacity of India's largest reservoir is gone between 2002 and 2008," Dr Rodell told the BBC. The northwest of India is heavily irrigated; and the Indian government's State of the Environment report, published on Tuesday, noted that irrigation increased rice yields seven-fold in some regions compared to rain-fed fields. Dr Raj Gupta, a scientist working for the International Maize and Wheat Improvement Center (CIMMYT), said that the current drought would lead to more groundwater extraction. "Farmers receive no rains so they are pumping a lot more water than the government expected, so the water table will fall further," he said. "The farmers have to irrigate, and that's why they're pumping more water, mining more water. The situation has to stop today or tomorrow." Dr Gupta noted that some farmers might be able to switch from rice to crops that demand less water, such as maize or sorghum. But, he said, that would depend on government policies - which have traditionally promoted rice - and on market demand. Climate change is likely to be a constraint too, with the area of South Asia suitable for wheat forecast to halve over the next 50 years.